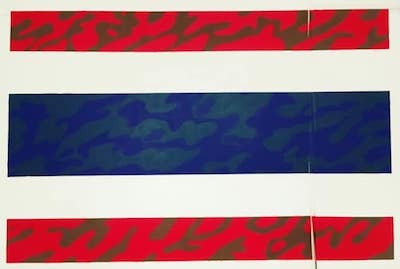 Miguel Januário's exhibition More or Less opened at Bangkok's WTF Gallery on 14th December last year, and runs until 19th February. 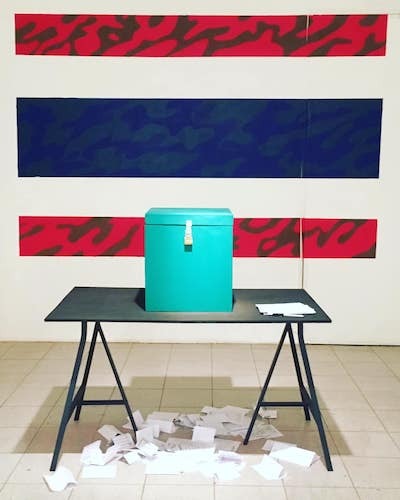 The exhibition includes an interactive installation commenting on Thailand's political situation since the 2014 coup: a simulated polling station, complete with ballot papers, a pen, and a ballot box. 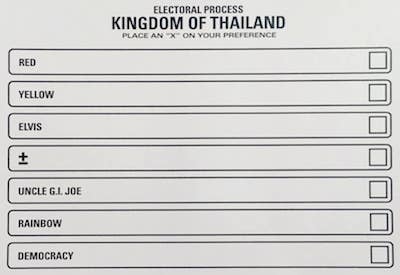 On closer inspection, the ballot papers are a parody of recent Thai political factions, and a Thai flag backdrop is overlaid with army camouflage to indicate the military's pervasive influence over the country. Also, the ballot box has no bottom, so ballot papers fall straight onto the floor, symbolising the futility of elections that are often invalidated (as in 2006 and 2014) or postponed. According to the junta, a return to democracy is always on the horizon, and elections are perpetually due 'next year'. In the meantime, gallery visitors can vote via Januário's ballot papers. A month after the coup, on 28th June 2014, Prayuth Chan-ocha promised an election by October 2015. On 9th February 2015, he committed to an election by February 2016. On 9th August 2016, he announced that an election would take place by November 2017. On 10th October 2017, he gave assurances that an election would happen by November 2018. On 27th February 2018, he pledged an election by February 2019, though another delay seems inevitable.